On May 17, the 37th Anniversary of the Dublin and Monaghan bombings, in which Loyalist Paramilitaries allied to the British State killed 33 people and injured hundreds more in the deadliest day of the troubles, the Queen touched down in Dublin for the first visit by any monarch to the south of Ireland in 100 years. She arrived draped head-to-toe in green; a hackneyed cultural gesture that was more reminiscent of an English woman in Ireland on a hen night than a state visit. 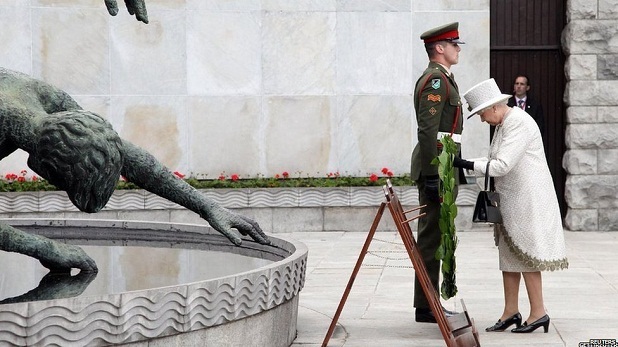 In perhaps the most bizarrely provocative gesture of the trip, of which there were many, she approved the invitation of four leading members of the loyalist death squad and proscribed group, the UDA, to attend her visit of the Memorial Gardens at Islandbridge; to commemorate the 50,000 Irishmen who died fighting for the British Empire during World War I.
Policing costs for the visit came to 30 million Euros, not including the wider cost to the economy of closing off much of Dublin’s city centre and tourist attractions as well as parts of the surrounding motorways to the public during and leading up to the visit. Mimicking the British Police in the run up to the Royal Wedding, the Gardai arrested many left-wing and republican activists without charge immediately prior to the visit. The Gardai routinely tore down posters put up by socialist republican group Eirigi, declaring their opposition to the visit as well as flyers advertising the Dublin Anarchist Bookfair (put up with permission from Dublin city council) that contained no reference to the visit. The event, organized by the Workers’ Solidarity Movement, was nonetheless well attended by hundreds across the Irish left and beyond although the Gardai attempted to intimidate attendees further by parking two patrol vans full of policemen outside the gates of Liberty Hall (the headquarters of Ireland’s largest trade union, where the Bookfair was held) during the event. Protests reached a peak during the Queen’s visit to Dublin Caste for a state banquet attended Ireland’s much-detested financial and political elite, culminating in the arrests of over 20 people and the injuring of many more. Many who have no truck with republicanism lauded the attempt to reclaim the city back from the state. Security was much reduced days later during Obama’s visit. The president praised the Dublin government’s austerity measures and reiterated their necessity during his meeting with Taioseach Enda Kenny despite prescribing the opposite medicine for America’s economic malaise. 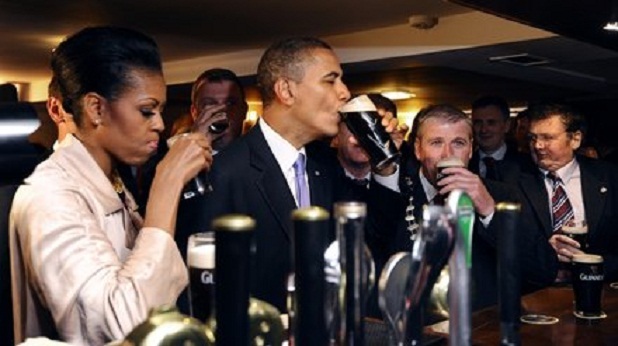 After getting his car stuck on the ramp at the entrance to the American Embassy the President traveled to tiny village of Moneygall where his great-great-great grandfather left for America during the Irish Famine. Whilst there he met his 8th cousin Henry Healy, known locally as “Henry the Eighth” and drank at a local pub, making a point of paying his tab. Volcanic ash clouds forced the President to cut his trip short and fly to England a day early. Last month after a prison officer was found to have planted a note in the cell of a republican prisoner threatening the Maghaberry prison’s governor and containing details of his address, I referred to two recent reports condemning both Maghaberry and the Prison Service generally calling for the latter to undergo a “root and branch” reform. Such calls have remained unheeded even after Samuel Carson (19) and Frances Mckeown (23) died this month at Hydebank Wood. On Monday a third man Aaron Hogg (21) has been found dead in his cell with no explanation of the cause of death given by the prison authorities. Other prisoners are currently in hospital after enduring beatings from prison staff and on Thursday the prison service announced a 72-hour lock down of the republican wing. It is in this hostile climate that veteran republican Marian Price (57) has had her license revoked by Secretary of State for Northern Ireland Owen Patterson shortly before the queen’s visit (allegedly for attending a commemoration of the Easter Rising led by dissident republicans) and has been sent to Maghaberry men’s prison. The northern Irish football team played its southern counterpart for the first time since 1999 in Dublin this week for the inaugural Carling Cup of Nations. 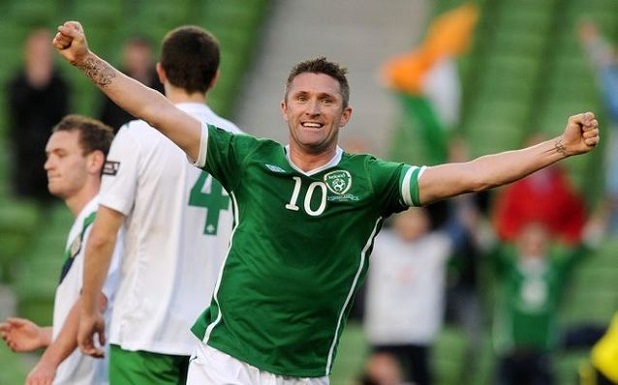 While the rugby and cricket team (who host Pakistan in Belfast this weekend) are run on a national basis, football in Ireland is split along partitionist lines with the Irish Football Association (IFA) representing the north and the Football Association of Ireland (FAI) representing the south (including players such as Manchester United’s Darren Gibson). Disputes over the FAI recruiting northern players such as Shane Ferguson and travel restrictions have led to a ban by supporters of the northern side with only 210 traveling down. Tensions grew as southern supporters booed the playing of “God Save the Queen” (the first time is has been played in the derby) later chanting “there’s only one team in Ireland” as well as, more topically, “do you want to play for us.” The match ended in a 5-0 drubbing of the “visiting” side with Robbie Keane’s two goals leaving him just two shy of an international half century. An inquiry into the murder of human rights lawyer Rosemary Nelson by Loyalist Paramilitaries in 1999 has found that the British security services “increased the danger to her life” and “failed to take reasonable and proportionate steps to safeguard” after it was aware her life was under threat. Amnesty international has said the findings were a “sad indictment” of the criminal justice system in the north. The Inquiry is significant in that it is the first to report on a murder that has taken place after the end of the so-called ‘troubles’ making it harder to put misdeeds committed by the British security services down to “another era” or the “stress” of combating the IRA. It is also made all the more relevant by the fact that Ms. Nelson defended the Garvaghy Road Residents’ Collective in its cases against the Police and Loyalist marchers (a dispute that continues to this day) and republican Colin Duffy. Colin Duffy was witness to the murder of his friend Sam Marshall by gunmen using a car belonging to British Intelligence in 1990 and was falsely convicted of the killing of a British soldier in 1993. The case was quashed the verdict when it was found that the witness used to convict Duffy was in fact known to the police as a member of the proscribed loyalist death squad the UVF. He remained the victim of police intimidation and false charges until 2009 when Duffy was again accused of killing of British soldiers and has spent the past 15 months at Maghaberry prison awaiting trial. The Inquiry into Nelson’s murder found that the RUC (the pre-2001 name of the British Police force with serves in the North of Ireland) were guilt spreading “malicious rumours” of an affair between her and Duffy and “publicly abused and assaulted Rosemary Nelson… having the effect of legitimising her as a target.” While the report refrained from saying there was “direct collusion” between the loyalists who killed Rosemary Nelson and “British state agencies” it did not rule out the possibility that “rogue” army or police personnel had a hand in the killing. 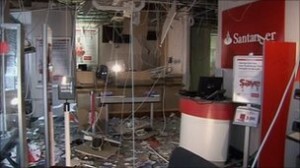 A bomb exploded inside a Derry branch of Santander last Saturday destroying the building in which the bank was located adequate warnings ensured there were no civilian injuries. Curiously immediately after the bombing Sinn Fein, in addition to condemning the group who carried it out, did not name the bank that was attacked (which was still unclear) but leaked that a “building society” had been bombed, a claim that is still being repeated elsewhere in the media. A claim that is still being repeated in the rest of the media. Assembly and Council elections took place this month on the same day as the UK-wide AV Referendum. Elections for the Stormont Assembly and local councils (unlike any of their equivalents in Britain) in Northern Ireland already use a much far complicated transferable voting system (STV) than AV, possibly leading to a better informed electorate on the issue and the fact it had highest level of support for AV among any of the 12 regional counting areas of the UK (45%). The constitutional nationalists; Sinn Fein and the Social Democratic Labour Party (SDLP) supported AV while all the unionist parties (the DUP, UUP and TUV) opposed the change. Unlike the other 11 regions Northern Ireland was not broken up into electoral districts so it is hard to gauge how closely nationalist and unionist areas stuck to party lines though the level of support for AV corresponds exactly to the size of the nationalist vote. In the Stormont Assembly elections meanwhile Sinn Fein continued to eat into the SDLP’s electoral base (as it has done since 1998.) While Nationalist areas saw sharp rise in votes for far left parties such as People Before Profit (PBP), the Socialist Party (both organized in the South under the United Left Alliance banner) and the Official IRA linked Workers’ Party the bordering Unionist constituencies of the Lagan Valley and North and South Antrim saw Sinn Fein and the SDLP lose both seats to unionist parties. The latter situation means that for the first time the combined seats and votes (both in percentage and real terms) for the two nationalist parties have decreased. This trend was also seen in council elections (the first for 6 years) whilst the United Left Alliance’s folly not forming a northern strategy was further emphasized as the PBP and Socialist party ran against each other in some districts as well as the Workers’ Party, its offshoot the IRSP (contesting its first election since the early 1980’s and the decommissioning of its armed wing) and Eirigi in others. The need for co-ordination among far-left political parties was made most clear in the republican heartland of the Lower Falls where the IRSP, the Socialist Party, Pádraic Mac Coitir from Eirigi and John Lowry from the Workers’ Party all stood. Though the combination of Eirigi’s votes and those any of the other three far left parties would have been sufficient to secure the district’s 5th seat from Sinn Fein the split meant the seat was taken from the right, by the SDLP. Ironically John Lowry had also stood against Gerry Adams in West Belfast in the 1992 Westminster elections allowing the SDLP to win the seat from Sinn Fein by a few hundred votes (less than Lowry’s total) which in turn left spurred Adams on to wind up the IRA’s campaign in order to boost Sinn Fein’s electoral prospects. 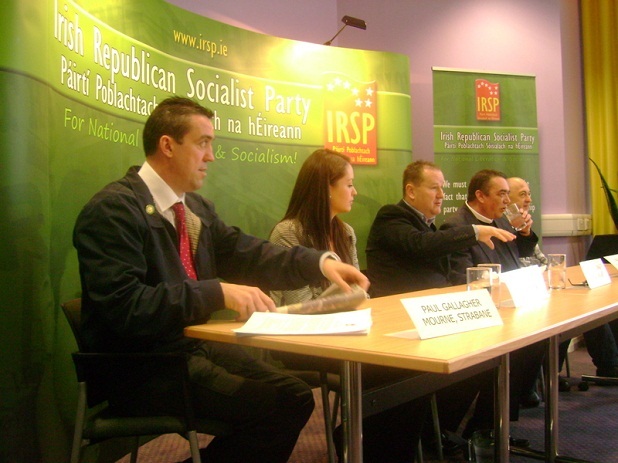 The IRSP also lost on a seat in Strabane by less than one vote however other Independent Republicans were successful such as Ex-SF assembly member Davy Hyland who was backed by various militant republican groups. Northern Ireland’s “Pro-Capitalism Party” meanwhile, garnered just 9 votes; a feat made all the more remarkable by the fact that 10 signatures are required to register a political party in the north.